The VENLOIC 2.1 Channel Bluetooth Wooden Floorstanding Tower Speaker provides amazing audio. Use Bluetooth to stream music from your smartphone, tablet or other devices. With everything you need for a quick and easy setup, upgrading to an amazing home theater experience has never been easier. The 2.1 Channel features powerful stereo speakers that boost your audio and deliver fantastic sound. This Bluetooth Tower Speaker provides seamless audio streaming, pairing easily with your Bluetooth-enabled devices, and listen to your music with a tap of a finger from anywhere in the room. High performance loudspeaker for music and home party with powerful bass-full-range stereo tower speaker provide high quality, amplified sound that is so clear, accurate and powerful. Entertaining friends with a wonderful listening experience in the background? VENLOIC 2.1 Bluetooth Floorstanding Speaker has you covered. Set the wireless tower speaker anywhere in your space and surround yourself with deeper bass. 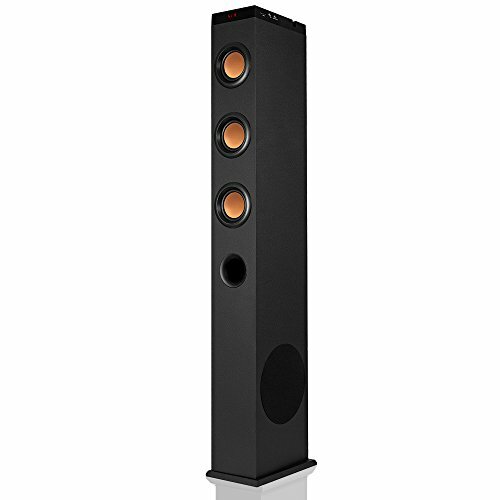 Wireless connectivity and streamlined design let you expand your surround sound system easily.The contemporary design allows this tower speaker to be matched with a variety of household styles. STEREO SOUND: This bluetooth tower speaker features stereo speakers and powerful subwoofer that boost your audio system and deliver fantastic sound effect. The output power of this 2.1 Channel system is up to 65W. With this tower speaker, you will enjoy an impressive listening experience when you play your music, podcast or other audio sources from your devices. CONNECT EASILY: This tower speaker could be connected wirelessly with your smartphones, tablets or other devices via bluetooth. Devices without bluetooth capability could be plugged in via the Aux-in port (RCA Cable included). You could still play your music files through the USB or SD/MMC port. INNOVATIVE DESIGN: You don't need a huge space to place your tower speaker. The stylish slim design will leave you a plenty of room for dancing in your house or even your travel trailer. The contemporary design allows this tower speaker to be matched with a variety of household styles. USER FRIENDLY: Remote control enables you to use the speaker easily. A docking station is specially designed for holding your devices. In addition, there is a USB port for charging your devices. EQUALIZER SETTING: Four EQ modes let you enjoy a variety of music style, including Normal, Pop, Rock and Jazz for your selection, which function at USB/Bluetooth mode. If you have any questions about this product by VENLOIC, contact us by completing and submitting the form below. If you are looking for a specif part number, please include it with your message.